Planning the Programme for Clapham Book Festival 2018 is well underway, with only the slight hitch of a royal wedding and the FA Cup Final to over come ( we did – we changed the date – we’re not proud ). It will now take place on 12th May and the countdown has already begun. Nothing is finalised yet, but we hope to have the Programme settled by the end of January, then our promotion and marketing activity will commence. To that end we have, this year, advertised on Reach for a volunteer to help with the digital marketing. If anyone knows of a likely candidate do point them towards this notice. One of the sessions to be included this year will be on poetry. The very first Clapham Book Festival in 2016 included one such by local poet Michael Glover, which was very well received. 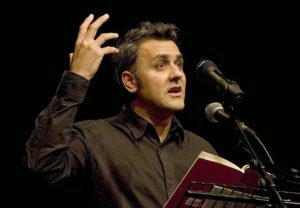 This year we hope that Daljit Nagra, until recently Poet in Residence at Radio 4, will host a session talking about the writing and performing of poetry today, with some other practitioners of the art. His Look We Have Coming to Dover! won the 2007 Forward Poetry Prize, his second collection Tippoo Sultan’s Incredible White-man Eating Tiger Toy Machine was short-listed for the 2012 T.S.Eliot Prize. In the meanwhile and in celebration of yesterday’s Poetry at Work Day, I include here a mini-selection of poetry by writers in a Writer’s Circle to which I belong, none of whom are published poets, though all are published writers, of one kind or another. More to come on the Reader’s Page later. In brazen pools under the sunset’s hammer. I watched the dying river simmer. Sifted through time, of that ancient clamour.